Over the last decade we have all seen the impact of climate change. While most scientists agree that much of this can be attributed to anthropomorphic causes, others feel that it’s part of a natural cycle. In any case, climate change is upon us and impacting human lives, worldwide. This post discusses how utilities are strengthening the electric power grid to mitigate line outages and restore power quickly after extreme weather events. In the last few years, drought conditions in the Western United States have led to many devastating and deadly fires. Some, such as the “Cascade” fire in Yuba County, California, have been blamed on sagging power lines. To combat such occurrences, companies such as Southern California Edison are leveraging technology to minimize risk by installing Advanced Conductors such as ACCC®. These conductors can not only double the capacity of existing transmission corridors, they also don’t sag like conventional steel reinforced conductors under peak load conditions when the electrical resistance of the wires causes them to heat up and expand resulting in excessive and dangerous conductor sag. Advanced high-capacity conductors and other new devices can also allow utilities to shut down various circuits when dangerous conditions exist and re-route power around these areas to keep power flowing – and reduce the risk of power line fires. In the wake of several severe hurricanes in the Gulf States, other utilities such as American Electric Power are upgrading existing transmission corridors with ACCC, not only to increase line capacity, but also resist damage from extreme winds, flying debris and corrosive salt air. 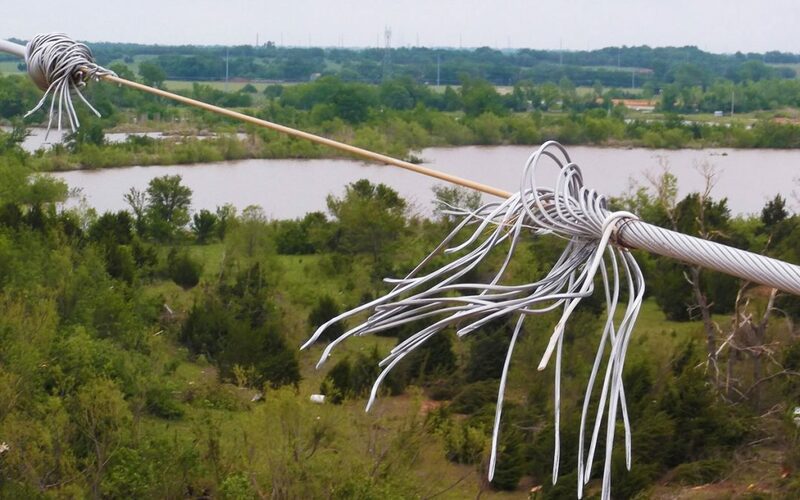 In 2013, Oklahoma Gas & Electric’s use of the ACCC conductor helped them put their grid back in service quickly following a direct strike from a EF-5 Tornado. A large container, picked up by the intense wind, slammed into a steel monopole supporting ACCC conductor bending the pole to a 45 degree angle. The shock wave snapped the aluminum strands on the ACCC conductor, but the composite core prevented the monopole from hitting the ground. The fact that the conductor core survived allowed linemen in two bucket trucks to quickly splice in a 20’ section of conductor and quickly put the line back in service. If the core had failed, the linemen would have needed to bring in much more equipment and the repair could have taken several days. This is an example of what the utilities call resilience. Our grid can’t handle every form of punishment, but when things hit hard, our utilities are doing their very best to restore power quickly. In the North East, companies such as National Grid are installing ACCC conductor to ensure power delivery during extreme winter conditions when heavy ice buildup can cause sag-trip outages. You may recall that in 2003 (during peak load summer time conditions), sagging conductors caused a series of cascading sag-trip outages that shut down the entire eastern grid for several days. 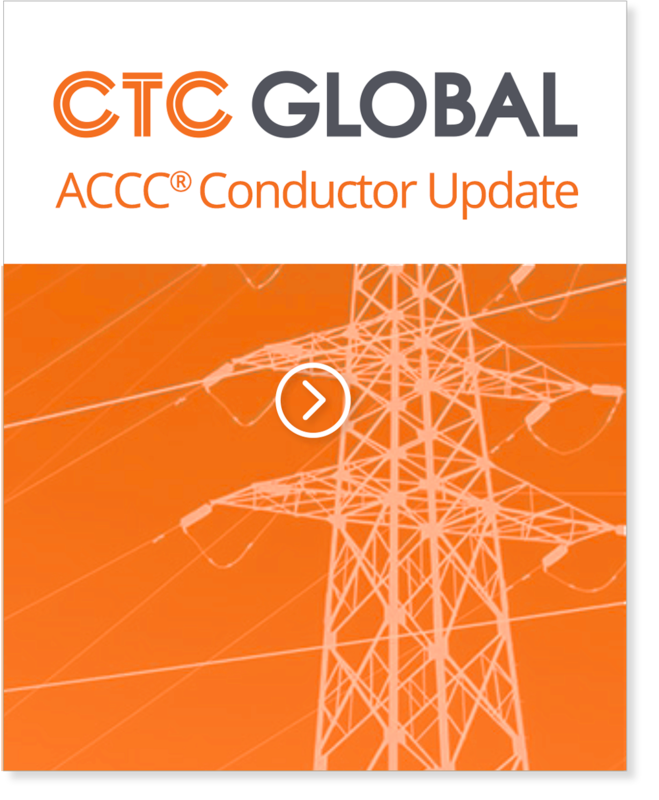 It was this event that led CTC Global to develop the high-capacity, low-sag, energy-efficient ACCC conductor that, since that time, has been deployed to well over 600 projects in more than 50 countries. If you are not familiar with the ACCC conductor, please take a closer look. The impact of climate change is very serious, and we need to leverage every tool we have. Endnote: While the ACCC conductor offers significant value to its users and ratepayers, it also offers improved efficiency that can help combat climate change. For instance, in 2016 American Electric Power replaced 240 circuit miles of a double-bundled 345 kV line in Texas (Video Link). The improved efficiency of the ACCC conductor compared to the same size steel reinforced ACSR conductor that it replaced, reduces electrical line losses by over 300,000 MWh per year. Based on all combined sources of generation in Texas, this reduces CO2 emissions by over 200,000 metric tons per year which is the equivalent of removing 34,000 cars from the road every year.